Judith Taylor was born and brought up in Perthshire and studied at St Andrews, Oxford and Sheffield Universities. She lives in Aberdeen where she works as a librarian and is a member of the editorial team of Pushing Out the Boat. Her poetry has been published in magazines including New Writing Scotland, Poetry Scotland, MsLexia and The Rialto, and her first chapbook collection, Earthlight, was published by Koo Press in 2006. 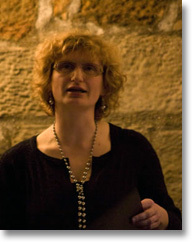 She has appeared at Shore Poets, Wordfringe and most recently at StAnza.